Previous Post Planting one more seed. Wow, wow, wow. Thank you so much for this blogpost, Danny. I’m so fired up with lettering right now, I’ve got started and I just can’t stop and this is just adding to that fervour. I’m going to have to look at some these books that I haven’t seen before. A week ago I rarely added lettering to my sketches, now I can’t imagine not added lettering to anything I draw from this point on! What Helen said! And Danny your enthusiasm BURSTS outta the screen and I find I’m being carried along with it with a great big silly grin on my face. So many wonderful books to check out. You MUST add this, or a link to it at least, to the end of Koosje’s week (if she doesn’t mind… nah, I’m sure she won’t mind, she was your inspiration after all). What a bonus to go with our first week. Thanks for the inspiration! I would also recommend Edward Gorey not just as an artist but his awesome style of handlettering. Fantastic collection of hand-lettering samples. Thank you. Fabulous inspiration!! Thank you for sharing all of the different artists. I love Lisa Congdon as well and am excited to look at everyone else’s works!! Thanks again! Yes please add a list of these authors and books, Loving the lettering class… so much fun. Can’t emphasise enough how incredibly helpful it is to be directed to excellent work when you’re still finding your way around. Thanks very much and would appreciate more if you are so moved. This was BRILLIANT, Danny! Thank you. It really did get me going this morning. gs and 5s and sometimes ys are my favorites to draw! Your W and M are now mine! That cross in the middle is so cool. Another book that I use all the time just to get “happy” is When Wanderers Cease To Roam by Vivian Swift. She hand lettered the whole book and sketched and watercolored all her musings. I read it over and over just to absorb its beauty. Thanks for a great post today! That was inspirational! Thanks for all the examples by various artists. By the way, I really like the varied lines you’re getting with the nib you used to do your alphabet. Perhaps you’ve shared what it is elsewhere, but would you mind posting what nib you’re using here? Thanks! When can I come by to hug you? You’er brilliant! Thank you soooo much for showing this. It lets me relax about lettering my pages, because apparently it doesn’t have to be perfectly lined or all the same size. It just has to have character…what a relief, pheww! What a great way to start off a new week! I was blessed (cursed!) with nearly perfect handwriting and consequently frequently have a difficult time letting go. Sometimes I just want to mount a large piece of butcher on the wall and scrawl all over it and loosely as I can. Awesome alphabet, Danny! Thank you for sharing it and for the nice tips, books and inspiration. Let’s not forgot Maira Kalman, a wonderful writer and illustrator. “And the Pursuit of Happiness” and “Beloved Dog” are two of my favorite books. You have taken inspirational Monday to a new level. 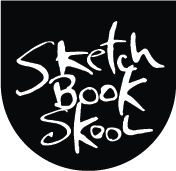 Sketchbook skool is becoming a powerful example of Synergy in action. Grateful to be a small part of all this. Fascinating! Thank you for the inspiration! Great, Danny!!! That was great, great, great. Inspiring. Inspired. Thank you! Can you list the books you showed us? Thanks. Danny, your enthusiasm JUMPED through my computer screen! I have Felix’s book too and can’t wait for his class. I will no longer feel guilty for my growing book collection (I’ll just buy a bigger bookcase!). I never realized how much I love hand lettering! Thanks again, Danny! I love this and it has inspired me! Thank you Danny! I loved this video — Can you make a list of the artists and books in this video? I want them all!! !